Today we continue our examination of Newark as a major industrial center, concentrating on the 19th century. In 1869, John Wesley Hyatt was experimenting with the invention of celluloid, the material we now call plastic, in his landlady's Albany, N.Y., apartment. Three decades later he was one of Newark's most successful businessmen. Like Peter Ballantine, Hyatt moved to Newark where he developed his invention into highly successful commercial enterprises. He came here to experiment with nitro-cellulose and produce a substitute for elephant tusks, which were becoming difficult to obtain from Africa. A New York firm had offered $10,000 to anybody who could come up with a substitute. Hyatt soon found that solution. His product was so successful he found himself in a five-story factory on Newark's Mechanic Street. Hyatt and James Brown, his partner and co-inventor of this 'miracle' product, not only produced the billiard ball substitute, they also manufactured dental plates, knife handles, piano keys, harness trimmings, buttons, shirt collars and cuffs, truss pads, napkin rings and mirror backs. The invention of plastic spurred the creation of many firms here and throughout the industrial world. Such great expansion occurred because of the many incredible qualities of the new product—toughness, transparency, elasticity and the fact that it did not conduct electricity. Plastic also possessed a hardness that resembled rubber but did require vulcanization, and it was not affected by exposure to the atmosphere or moisture. Another plus was that it could be molded into almost any form at 275 degrees. Hyatt's company at 295 Ferry St., between Niagara and Magazine streets, was one of the first successful plastics operations nationwide. In 1872, he changed the company's name to the Celluloid Manufacturing Co. The following year, he and Charles Burroughs, his assistant, patented an injection-molding machine that allowed them to make harnesses, buckles, buttons, combs and shaving brushes. In 1890, their enterprise reappeared as the Celluloid Co. By 1903, its annual multimillion-dollar business made it one of the city's most successful firms. This continued until 1907 with the invention of Bakelite, a phenol-formaldehyde product. Rumors about celluloid's safety somewhat hurt profits, but the company nevertheless remained strong throughout the 1930s, producing more than 1,000 products under the trademarks of celluloid, zylonite, lithoid and texoderma—the latter hailed as the best substitute for leather. This was an amazing claim to make in Newark, the most 'leatherized' city in America. It is difficult to select just one Newark jewelry manufacturer to represent this segment of the city's economy since the industry's origins reach back before the Revolution, and there is still a company in town whose products are sold nationally. In the 1870s, following the great Newark Industrial Exposition, 51 companies of varying sizes produced jewelry. By 1907 there were 178. If a typical American were to have worn gold or silver rings, chains or other items after the period of the 1850s, the items probably were made in Newark regardless of the fact that they were stamped London, Paris or Venice. It was a standard custom to pass them off as 'better-quality European merchandise' for almost a century following the Revolution. One of Newark's earliest jewelers was James Madison Durand, whose great-grandfather worked in gold and silver in 'Jefferson Village,' or Maplewood, as early as 1756. The young Durand is particularly interesting because of the route he took to become a businessman, starting as an apprentice, then working at the jewelry bench in an already established firm. Finally, he established his own business. A fledgling businessman in the 1830s, Durand, by the time of his death in 1895, had become one of America's leading jewelry manufacturers. His success was attributed by one of his contemporaries as 'plodding work, careful attention to details, vigilant and constant attention to the business, and a superior skill in design and workmanship.' Durand and Co. was located at 49 Franklin St., with salesrooms in New York City at 9 Maiden Lane. 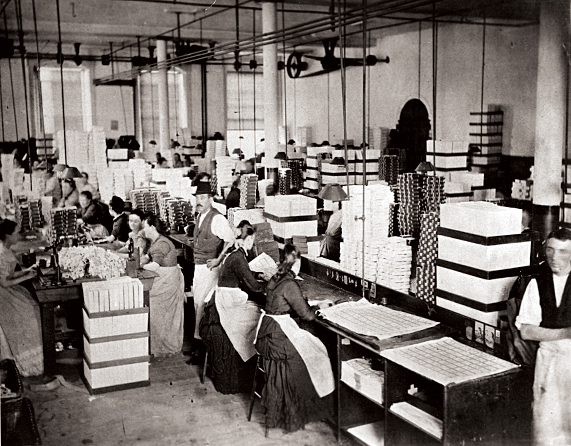 Eventually, Durand and Co. employed 125 men and had an annual production in excess of $500,000. Carter Hawkins and Dodd was located at Mulberry and Park streets, with New York salesrooms at 1 Bond St. By 1873, the company was advertised as 'the largest manufacturer of jewelry in the world. For Newark to be thus distinguished was a cause for municipal pride. Jewelry making in Newark in the prior century was largely a product of individual silversmiths and goldsmiths, but with the emergence of 'modern' jewelry factories in the 1870s manufacturing costs were lowered by mass production. Better designed products brought in more sales. At Carter Hawkins and Dodd, 14 and 18 karat fine gold was used not only for rings and chains but also for lockets, brooches, earrings and bracelets. The firm also employed the new Balbach sweeping process to recover precious metal droppings and carefully laundered their workers' smocks and aprons to reprocess metal discards. In 1896, New York's most prestigious jeweler, Tiffany, moved its great silver jewelry plant to north Newark's Tiffany Boulevard on a bluff overlooking Second River. An elaborately designed French chateau-type factory was built of imported 21 one-inch-thick English bricks. Among the items produced within these walls were the stationery of an English prime minister, the cutlery of a French duke, and the leather dispatch boxes of several American presidents, along with the famous blue Tiffany boxes that many filled with one's own sentimental collectibles. Although our jewelry industry is greatly diminished in size, Newark's name still is 'out there' because of the work of companies such as Krementz, which continues to this day as Newark's ambassador in the world of costume jewelry. Clark Thread Mills, originally the Passaic Thread Mills, was established in Newark and across the river in the Hudson County communities of East Newark, Harrison and Kearny by George Clark of Paisley, Scotland, in the 1860s. 'Probably no other branch of American industry has attained to greater supremacy than the manufacture of spool cotton, and the Clark thread works are among the largest manufacturing establishments of the country, and are doubtless the largest located in Newark. This is to be a great credit to the City of Newark,' one reporter wrote. George Clark came from a long line of wealthy Scottish threadmakers. He settled in Canada, lived briefly in New York, and finally established his fortune in Newark. He brought with him Scottish capital, technical know-how, and a great desire to succeed in the American market place. In 1866, Clark established the Passaic Thread Co. in rented quarters on Fulton Street. He later moved to McCarter Highway, where the name of the new plant was changed to the Clark Thread Co. One of his greatest successes was the creation of a new product, O.N.T. (Our New Thread), which cornered the market on sewing machine thread and was described as a cord thread made of three strands of two-cord thread twisted tightly together in cable construction. At the time of his death in 1873 more than a 1,000 mill hands were working in the thread works. After various mergers, Clark joined with its American archrival, J.P. Coats, 'thereby creating almost a worldwide monopoly in the sewing thread industry.' George Clark was succeeded by his brother William, who continued to enlarge the company. By his retirement in 1897, the firm had built the great Clark works in East Newark and doubled its number of employees. During the 1930s the company kept up with developments in the industry. As synthetic fibers began to be introduced into the trade, they became leaders in this area, too. The 1930s also marked the beginning of the end for the New Jersey mills as they began a steady move to the South. By 1947, Newark Clark Mills was only a memory. In 1954, the final merger with J.P. Coats produced the Coats and Clark Thread Co., still a world leader in its field. Today two large groups of the old Clark buildings remain. The Hudson County, East Newark site remains largely intact—a city block of approximately 40 structures little changed on the outside with the exception of the towering, now a truncated smokestack, and its windows filled partially with cinder blocks and ugly little window casings. The three-story red brick rectangular buildings are buttressed by truncated brick fire towers with wooden truss interiors supported by cast-iron support columns. The Newark Clark buildings included at one time six major four-story brick mill buildings with segmental arch windows, corbelled roof cornices, and an outstanding tower and belvedere, possibly one of the original 1860 structures. Attached to these buildings were four large brick buildings that wrap around the contour of the block. The brick-faced three-story reinforced concrete recreation facility, c1910, was at McCarter Highway and Clark Street. While Clark Thread was in Newark for approximately 80 years, its influence on Newark was immense. It was a major contributor in making the city one of the nation's greatest manufacturing centers. It was also an innovator in labor-management relations through experimentation with worker benefits and recreational activities. It would be easy to criticize the industrial giants like Clark Co. for leaving the city, but this was all part of a pattern taking place across the nation. Interestingly, many of the companies that went South are now abandoning those 'greener pastures' for cheaper labor in South America and Asia. Where will they go next? Possibly, some 21st or 22nd century genius will find a way to return manufacturing back to Newark. And why not? We have new technology being developed at NJIT, Rutgers-Newark and UMDNJ. We have a transportation network most cities would kill for. We're in the heart of the nation's biggest market, and we are at the American gateway to a newly emerging unified Europe. One ingredient that may be missing is a modern-day Seth Boyden, Thomas Edison, Hannibal Goodwin, John Wesley Hyatt or George or William Clark.